It appears that Max 5-1 tends to pick more volatile assets than 5-1. This observation makes sense given the reliance of Max 5-1 on the most extreme returns during the momentum measurement interval. 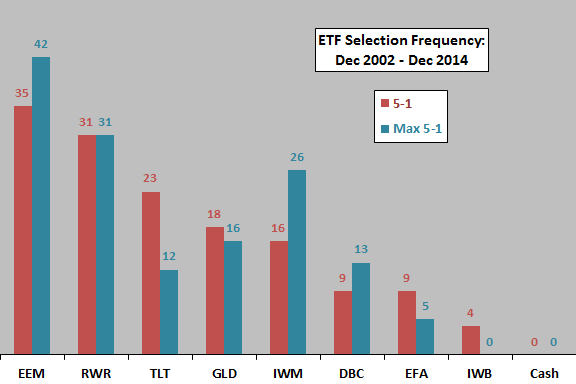 How do the winning sets of ETFs translate into investment performance? Reallocate/rebalance at the close on the last trading day of each month (assume that ETF momentum can be calculated just before the close). Measure Cash momentum for both strategies as a monthly compounded return over the past five months (a low-to-end return calculation does not make sense for Cash). Ignore trading frictions and tax implications of trading. Average gross monthly return for 5-1 (Max 5-1) is 1.51% (1.63%). Standard deviation of monthly returns for 5-1 (Max 5-1) is 5.50% (5.70%). The ratio of average gross monthly return to standard deviation of monthly returns, a rough gross monthly Sharpe ratio, is 0.27 (0.29) for 5-1 (Max 5-1). 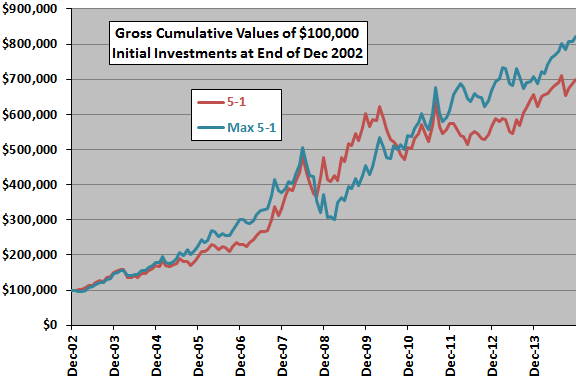 Maximum drawdown for 5-1 (Max 5-1) based on gross monthly returns is -24% (-40%). Given the relatively short sample period (especially in terms of number of equity bull and bear markets) and the variabilities of returns, the difference in results is not compelling. The greater maximum drawdown for Max 5-1 may make some investors reject it. 5-1 (Max 5-1) generates 58 (55) ETF switches over the sample period, so trading friction is not crucial to picking one strategy over the other. In summary, evidence from simple tests over a limited sample period suggests that the Max 5-1 version of the Simple Asset Class ETF Momentum Strategy may outperform the basic 5-1 version based on some performance metrics, but may suffer larger drawdowns during crises. As noted, sample size is modest (30 independent five-month momentum ranking intervals for five ETFs and fewer for three others) and includes only one full equity bear market. Use of 105 trading days for Max 5-1 and five months for 5-1 as momentum measurement intervals largely accounts for the difference in terminal values between the two strategies. In other words, generating 5-1 winners based on past 105-day returns rather than past five-month returns increases the 5-1 terminal value, likely per the kind of outcome variability in “Optimal Monthly Cycle for Simple Asset Class ETF Momentum Strategy?”.